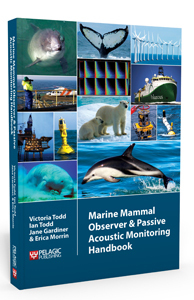 The ‘Marine Mammal Observer and Passive Acoustic Monitoring Handbook’ is an all-encompassing guide to marine mammal mitigation measures utilised during industrial activities. It seeks to improve standards worldwide for marine operations such as seismic and drilling exploration, wind farm piling, civil engineering, dredging, rock-dumping, and hydrographical surveys. 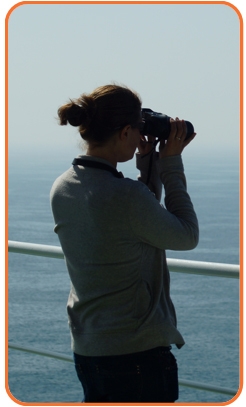 The handbook is the perfect accompaniment to all Marine Mammal Observer (MMO, www.marinemammalobservers.co.uk), Protected Species Observer (PSO, www.protectedspeciesobservation.co.uk), Marine Fauna Observer (MFO), Marine Mammal and Seabird Observer (MMSO), and Passive Acoustic Monitoring (PAM, www.pamsystem.co.uk) training courses, and a must-have for all those working in the field. The handbook encompasses a wide variety of topics arranged into ten, easily accessible chapters, that allow information to be sourced quickly in response to mitigation situations arising in the field. To cater for all stakeholders, regardless of experience, complex topics such as acoustics have been addressed with minimal equations, and are instead explained in text. For the more motivated reader, further reading has been suggested throughout. A series of six comprehensive tables are also included in the book that, where data exist, summarise the worldwide regional distribution, hearing ranges, and vocalisations of all marine mammal species and subspecies. A Marine Mammal Observer (MMO) surveying animals in the North Sea. © OSC 2013. The handbook is now available for purchase from the links below, for £34.99 (paperback), or £59.99 (hardback). Humpback whale (Megaptera novaeangliae) in Alaska. © Phil Clapham 2005. Dr Victoria Todd. © OSC 2013. 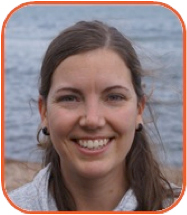 Dr Victoria Todd is a founding Managing Director and Marine Science Consultant at Ocean Science Consulting (OSC), and is a Visiting Scientist at Institute of Sound and Vibration Research (ISVR, Southampton University, UK). 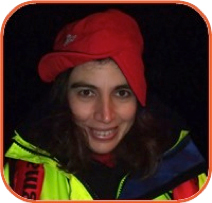 She undertook a post doc in commercial aquaculture at Scottish Association for Marine Science (SAMS, UK), planning and directing a comprehensive series of acoustic trials on seal scarers. She holds degrees in the ecology and acoustics of bats (PhD, Leeds University, UK), Oceanography (MSc, scholarship-funded by Woods Hole Oceanographic Institution, WHOI, US, and National Oceanography Centre, UK), and Marine Biology (BSc Hons, Liverpool University, UK). Dr Todd is also a Fellow of the Linnean Society of London. She is experienced in Galápagos fish taxonomy, marine mammal acoustics, and marine mammal visual and acoustic surveys worldwide for scientific, commercial, and defence contracts. Research interests include bioacoustics, the North Sea rigs-to-reefs concept, harbour porpoise foraging ecology around offshore oil and gas installations, and the effects of anthropogenic noise on marine life, all of which are core research topics at OSC. Dr Todd’s current scientific duties include training, survey design, project management, fieldwork, data analysis, reports, literature reviews, advice documents, Marine Mammal Mitigation Plans or Protocols (MMMPs), and publishing. As the Chief Scientist, she also coordinates most research. Ian Todd. © OSC 2013. 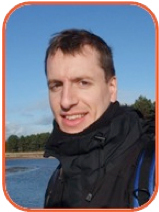 Ian Todd is a founding Managing Director and Marine Science Consultant at OSC, and is undertaking part-time postgraduate research in harbour porpoise (and other marine mammal) interactions with offshore installations and the environment at ISVR (PhD, Southampton University, UK). He holds degrees in Marine Resource, Development & Protection (NERC-funded MSc scholarship, Heriot-Watt University, UK) and Business & Economics (BCom with Honours, Edinburgh University, UK), various diplomas including Marine Engineering (HND, Glasgow College of Nautical Studies, UK), and a Marine Engineering Officer Certificate of Dual Competency (Class IV Steam and Motor Plants, Maritime & Coastguard Agency, UK). As a former Third Engineer Officer (including Health and Safety Officer) in the Merchant Navy, Mr Todd served deep-sea and worldwide with P&O Nedlloyd, then the world’s largest container-shipping company. He organises and supervises visual and acoustic surveys of marine mammals worldwide for scientific, commercial, and defence contracts. Mr Todd’s research interests are as per OSC’s core research topics, but include distance sampling, and his current scientific duties are similar to Dr Victoria Todd, but include recruitment, procurement, logistics, finance, brand development, environmental risk assessments, and Health & Safety (H&S). Jane Gardiner. © OSC 2013. Jane Gardiner is a Research Assistant at OSC. She holds degrees in Applied Marine Science (MSc) and Marine Biology (BSc with Honours), both from University of Plymouth, UK. 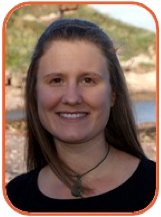 Ms Gardiner is involved with peer-reviewed research publications, and has served Lead (field position) for visual and acoustic surveys of marine mammals worldwide for scientific and commercial contracts. Ms Gardiner’s research interests are as per OSC’s core research topics and her current scientific duties include fieldwork, literature reviews, social media, and H&S. Erica Morrin. © OSC 2013.